Subsequent parts of the book examine debates about how to manage Germany’s forests. Drawing from minutes of the Prussian Landtag, Wilson shows how conservative landowners supported what they considered to be modern definitions of property rights in debates over an 1880 Prussian Forest Law. On the other side, left liberal critics supported the public’s traditional right to wander freely in the woods, collecting timber for fuel, gathering berries, and picking mushrooms. 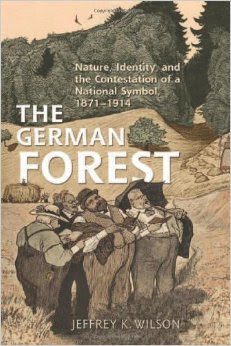 A subsequent chapter traces debates over Berlin’s Grünewald, with Wilson demonstrating again how left-liberal and some working class critics demanded that the Prussian state preserve a major forest in the city’s outskirts. In this case, enthusiasm for a beloved forest stemmed not from irrational anxiety about modernity, but in part from a desire to enhance recreational opportunities for the working class. Wilson notes, ‘The struggle to protect the Grünewald demonstrates the rational and progressive aspect of the forest discourse’ (p. 131). Support for forest preservation also came from the state, for different motives. In chapter five, Wilson shows how Prussian state foresters attempted to restore the degraded forests of the Tuchel Heath, in the Prussian East. In this case, state officials intended to scientifically manage the region’s forests and to discipline what they saw as an ethnic Polish population desperately in need of German Kultur. A dramatic story of heroes, thieves and frustrated officials, the story of the Tuchel Heath is well-supported with documents from German and Polish sources, and with lively illustrations from Oskar von Riesenthal’s Bilder aus der Tucheler Heide. See here for an earlier article by Wilson on a similar subject. For more on German working-class environmentalism, see here.